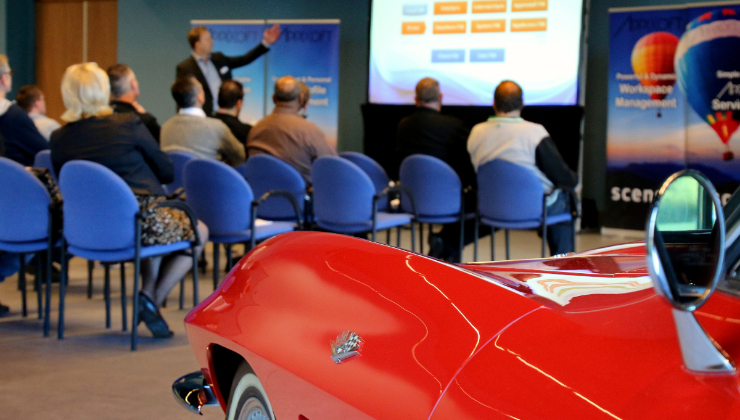 The latest AppiXoft Customer Day, held on Tuesday 24th January last, was a downright success in many ways. First of all, our much respected customers from all over the Netherlands certainly did not let us down. Admittedly, this was at least partly due to the Louwman Museum in The Hague, a unique venue we had chosen to serve as setting. With some 240 old-timers covering 130 years of automotive history, the museum offers a striking contrast with modern IT technology in which Scense Workspace Management plays its own role. On arrival, most visitors couldn’t resist taking a sneak preview on the extensive tour planned later that day and marveled at some amazing vehicles exhibited in the Great Hall. Pretty soon though, animated conversations started to fill the hall with customers exchanging their experiences with Scense software. With nostalgia just around the corner, others took a stroll down memory lane back to a time where IT in turn was still a long way from the state it is in today. In the nearby conference room, Richard Kuiper and Dennis van Eijk then elaborated on the latest Scense 10 release and their plans for the next couple of years. There was great enthusiasm about Scense Service Point, a brand-new web portal that allows Scense users to request and get services and software as they please. As to be expected though, the IT administrator remains in control at all times. Before lunchtime, Marcel Mayer of Prianto, AppiXoft’s distributor in the Netherlands, explained Prianto’s market approach and shared his thoughts on the gap between business and consumer demands using his own children as examples. The subsequent, almost two-hour guided tour took visitors along antique, stunning and downright bizarre vehicles, including cars that were used by celebrities such as Winston Churchill and Elvis Presley. Realizing it will be hard to top this experience in the future, we will certainly take on the challenge. After all, in our business it is all about user experience! Do you want to know more about the latest Scense 10 release, Scense Service Point or other Scense solutions?